Went after the exhaust Saturday morning. 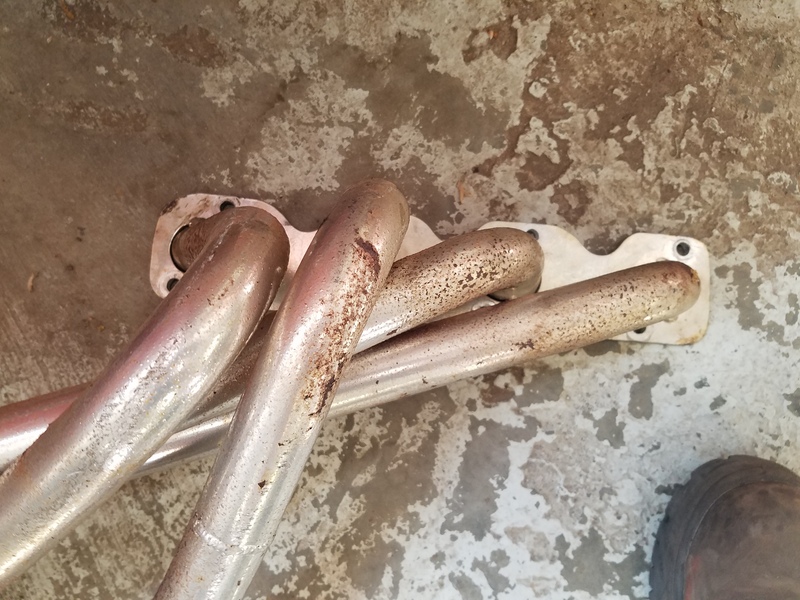 Beat it to death until lunch with PB Blaster, heat, hammers and crow bars but the slip fit fitting between the Ansa Sport Exhaust and the exhaust pipe to the header wouldn't budge. I posted a 'help' on the forum after searching the web, but didn't get much, other than heating it red hot with Oxy/acetlyne which I don't have, so I dropped it for the day and moved on to the header. Seems that wanted to put up a fight as well. The lower bolts were tight to the down pipes and hard to get, but after about an hour I managed to get them off, including one that decided to come off with the stud as well. Surprise! At least it didn't snap. Then it was wrestling with the header itself. Under the car. From above. From under. From above. From under...argh. It finally came free and out. Looks like a Stahl repro, but you guys be the judge. Actually doesn't look so bad, other than the rusty chrome. The following morning after sleeping on it, I decided the Sawzall was the best solution for the exhaust. I cut it just short of the slip fit, so I could re-use the Ansa Sport muffler.. 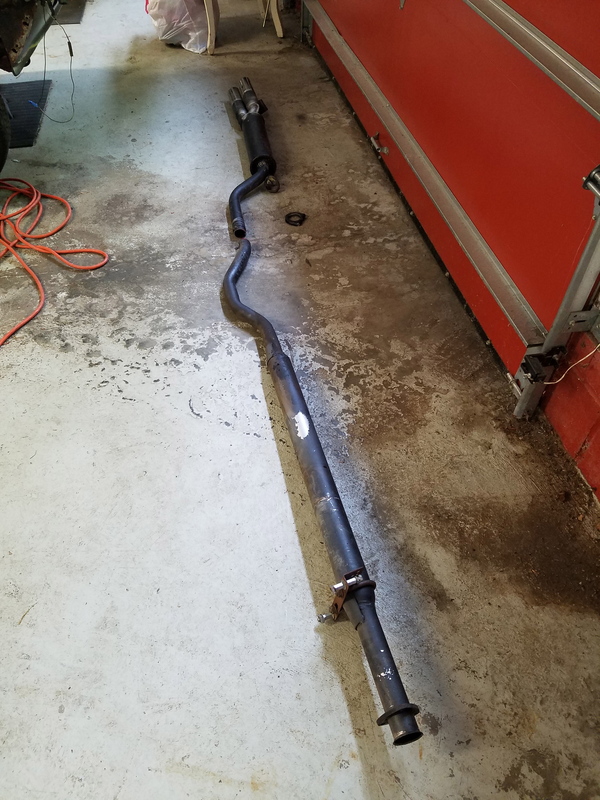 Turned out the entire exhaust was Ansa with a resonator pipe, so I'll be reusing that for sure. Next up was the driveshaft. Not too bad to loosen up, as you can spin it to get to the bolts. Of course one nut fought me, the last one, but a little heat and it was off. Supporting the shaft with my floor jack I loosened up the shaft support and down she came. Progress. Next up was the clutch slave cylinder. Man, that upper bolt is just damn unreachable! I struggled with that stinking thing for about an hour and finally jammed a wrench up there behind it to hold it in place while a ratcheted it from inside the car. Phew. That sucked. Took me forever for one nut. Spent some time disconnecting wires and hoses inside the engine bay, and labeling of course. 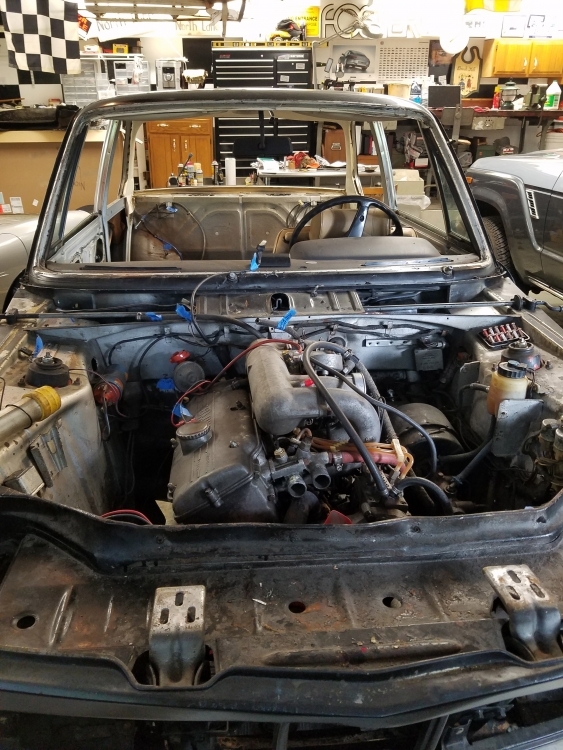 I'm getting ready to pull the engine. I was going to drop the subframe, but the more I look at it, the more I think pulling is a better way to go. I won't have to build a chassis dolly to get the car to the painter, and I'll have plenty to do with the parts I have off the car while it's being fixed up and painted. I've got a lot of hours into Fred so far. Many more to go I'm sure.